Eugenie Bouchard will once again be Canada's best female chance at a major tournament when she begins her French Open campaign on Tuesday, May 30th. The match is against Risa Ozaki who is Japan's third-highest ranked player at 72. Her highest career ranking was reached in April when she hit 70th in the world. Bouchard's preparation hasn't been ideal. She pulled out of the recent Nuremberg Cup due to an ankle injury, and there were fears she would not be ready for her first round match at Roland-Garros. She is fortunate to be playing her match late in the opening round and will have slightly more time to prepare, although it is never ideal to be sidelined immediately prior to a tournament. Speaking of preparation, Genie has played in three clay-surface tournaments in 2017, with her best return coming in Madrid as she made the quarter-finals. Her year got off to a great start with a semi-final appearance in Sydney just prior to the Australian Open, but since then her record has been average and her ranking has fallen steadily. Bouchard's chances of success at the tournament may hinge on how well her ankle pulls up ahead of her first match, although if she does manage to get through it will come down to how much she wants it. Bouchard has only reached the semi-finals of a tournament once in the last twelve months and it's hard to see her excel in this tournament. It remains to be seen whether she has the hunger to reach the second week of a major tournament. Bouchard's career high ranking of five came back in 2014 on the back of her near-fairytale Wimbledon appearance. She is yet to replicate the form that saw her reach that level though, and at the time of writing her ranking is 56th in the world. She has not been in the top 20 for nearly two years and was last ranked higher than 30 in September 2015. Although still Canada's highest-ranked female singles player, Bouchard needs to make changes to her game to ensure she returns to the top tier of women's tennis. Bouchard, despite being in doubt for much of the lead-up to the tournament, should go into her match against Risa Ozaki as the favourite. She won her only previous meeting between the two and although her ranking is falling she does outrank her Japanese opponent. Ozaki is not to be taken lightly though - she is slowly but surely rising up the WTA rankings and comes into the match at 72, up from 100 at the start of 2017. 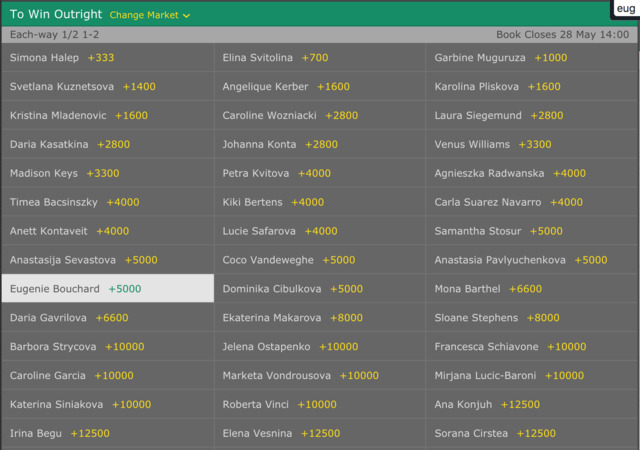 If Bouchard manages to win against Ozaki, she will likely be in for a second round match against seventeeth seed Anastasija Sevastova. The Latvian is currently ranked a career-best 18th in the world after starting the year at 35th. Sevastova will be a tough propect for Bouchard, so it is important she recovers quickly from her ankle injury to have any chance of progress. Catch all the action from Eugenie Bouchard's first round match against Risa Ozaki at 2:15pm CET on Tuesday May 30th.